Awnings all over New York City. Ray Davies said he knows what he is, he’s glad he’s a man and so’s Lola, and Merle Haggard took a lot of pride in what he was, as well. From a Forgotten NY point of view, I like an unadorned business awning sign that states what you’ll find inside with no obfuscation, no unwarranted puffery, and gets the job done with as few words as possible. Here’re a few sidewalk signs I’ve found over the years that fit the bill. Almost to a one, they date several decades old; modern vinyl awning signs are filled with just about everything sold within. In the old days, they just got to the point a little sooner. You’ll find Block Drugs on 2nd Ave. and E. 6th St., across from the old Fillmore East (Village mosaicist Jim Power has seen to it that you can’t miss that spot with an installation on the stoplight post commemorating the location). Stop by here during the evening—the neon still lights up in red. 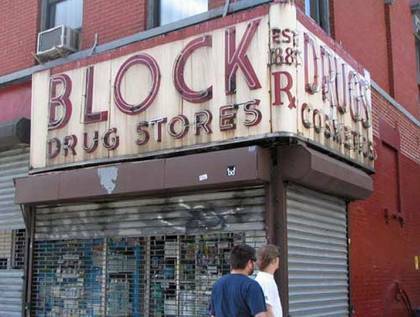 Block has been in business since 1885 but has only carried the “Block” name since the 1940s. The sign was installed in 1950 and much of the old-fashioned interior has been left intact as well. 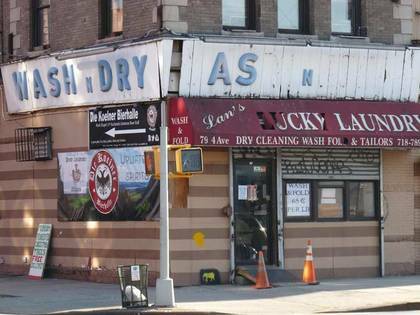 This green and white hand-lettered Cleaners sign could be found on E. 14th just south of Ave. U in Homecrest, Brooklyn. It’s a little unusual—a lowercase-style C has been placed in front, giving it a vaguely Cyrillic look. 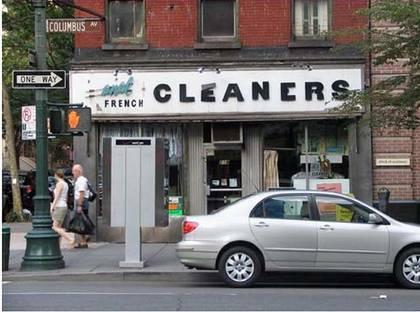 There’s been no need to replace the plastic letters on this French Cleaners sign on Columbus and W. 70th St., but since some of the letters seem to be detaching, management may have to soon. What is French cleaning, anyway? Is it generic for dry cleaning? Yes. Many cleaners advertise their process as being “French” but the term these days has nothing to do with France, though originally, dry cleaning is a French invention. The story goes that a 19th-century French chemist noted that when a kerosene lamp was accidentally turned over onto a tablecloth it was rendered cleaner than using soap and water; he began experimenting with solvents, and gradually the chemical process used in “dry” cleaning, without using water and detergent, came about. 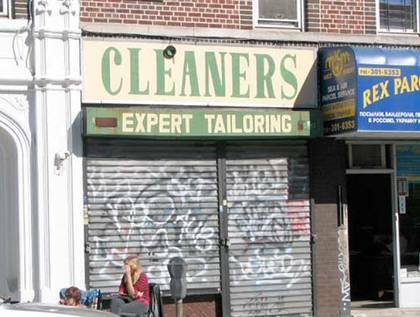 By now, dry cleaners stick with the term, thinking it adds a touch of class. 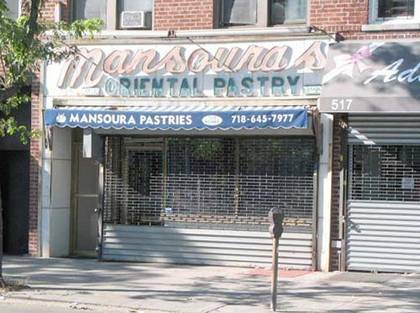 If Mansoura Bakery on Kings Highway in Midwood, Brooklyn, were commissioning a sign like this in 2018 they’d undoubtedly have to use a more PC description than Oriental, just to be on the safe side. Time was, you couldn’t walk down a main street of any small-to-medium town in America, revolve a deceased feline and not hit a Rexall drugstore, provided there were any dead cats on hand. Despite living in NYC for more years than anyone can imagine I know this because there always seems to be a blue and orange Rexall sign on period color postcards, or a Rexall drugstore in a black and white photograph of a main street someplace. These days, flinging a flat-lined tabby will likely produce a Starbucks or a bank branch, at least in NYC. Rexall was in business in the USA between 1902 and 1977, though it’s still extant in Canada. This sign on Victory Blvd. in Tompkinsville, Staten Island was replaced a few years ago by another unusual sign, Tompkinsville Pharmacy, which has raised wood letters on a vinyl background. 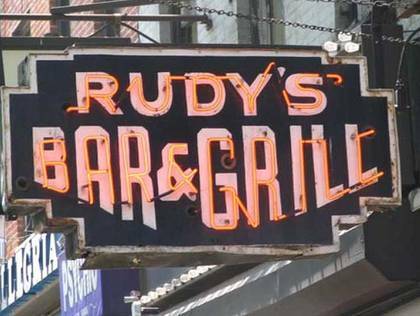 Rudy’s, on 9th Ave. in the 50s in Hell’s Kitchen, is one of the grand old bars dating back to when Hell’s Kitchen deserved the name—it opened in 1933. Inside you’ll find plastic pitchers of beer, ripped and duct-taped red vinyl booths, tin ceiling, linoleum floor, and free hot dogs. And this magnificent neon sign. This plastic-lettered sign on 4th Ave. and St. Mark’s Pl. 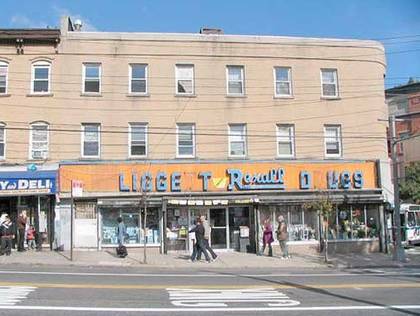 in Park Slope survived many management regimes, with one letter and then more falling off as time went on. Finally the time had come to retire it. It’s now the Long Qing Laundromat, with a new sign that it still blue and white.